Catching the attention of potential employers could be quite the daunting task unless you have a CV that truly stands out. This is why when developer Mathieu Passenaud needed a new resume, he decided to take a creative approach and opted to build an entire operating system with the sole intention of using it as a CV. 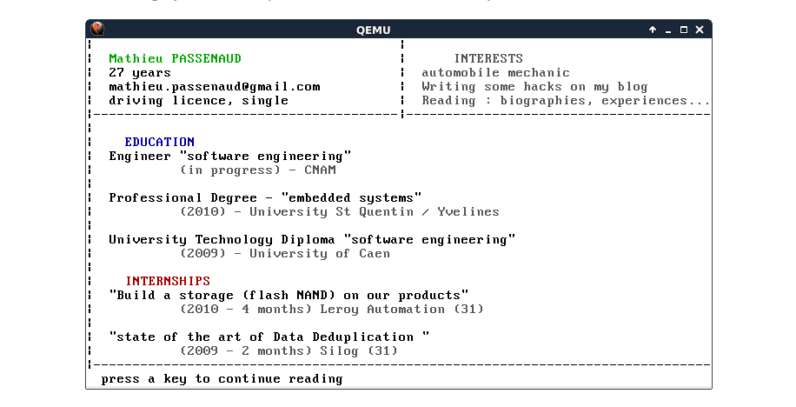 To get the project off the ground, Passenaud used an operating system he built for fun during his days as a student and modified it so as to look like an actual resume. To keep things simple, Passenaud relied mostly on the basic functionalities of the actual operating system, including multithreading, pagination, text console, interruption and exceptions. Head to Passenaud’s personal blog to read how the crafty coder built his resume in more detail or check out the source code for his impressive creation on GitHub. In case you’re eager to see how it actually works, you can run the CV OS by downloading and booting this ISO file.